Your day-by-day itinerary now includes Georgia Aquarium. Start off your visit on the 28th (Sun): admire nature's wide array of creatures at Georgia Aquarium and then see the interesting displays at World of Coca-Cola. For photos, ratings, where to stay, and tourist information, read Atlanta online road trip planner . Use the Route module to find travel options from your starting location to Atlanta. In April, plan for daily highs up to 74°F, and evening lows to 54°F. Finish your sightseeing early on the 29th (Mon) so you can travel to Huntsville. You've now added U.S. Space and Rocket Center to your itinerary. Kick off your visit on the 29th (Mon): Head underground at Cathedral Caverns State Park and then get curious at U.S. Space and Rocket Center. For ratings, photos, traveler tips, and other tourist information, refer to the Huntsville trip builder site . Getting from Atlanta to Huntsville by flight takes about 2.5 hours. Other options: drive; or take a bus. You'll gain 1 hour traveling from Atlanta to Huntsville due to the time zone difference. In April, daytime highs in Huntsville are 72°F, while nighttime lows are 52°F. Finish your sightseeing early on the 29th (Mon) so you can drive to Birmingham. Your day-by-day itinerary now includes Birmingham Zoo as well as Barber Vintage Motorsports Museum. Kick off your visit on the 30th (Tue): examine the collection at Barber Vintage Motorsports Museum and then meet the residents at Birmingham Zoo. To see ratings, reviews, maps, and tourist information, go to the Birmingham trip planner . Drive from Huntsville to Birmingham in 2 hours. Alternatively, you can take a bus. Expect a daytime high around 75°F in April, and nighttime lows around 53°F. Wrap up your sightseeing by early afternoon on the 30th (Tue) to allow time for travel to Orange Beach. Your day-by-day itinerary now includes Gulf State Park as well as Cetacean Cruises. Start off your visit on the 1st (Wed): take a tour by water with Cetacean Cruises and then immerse yourself in nature at Gulf State Park. For traveler tips, where to stay, reviews, and other tourist information, go to the Orange Beach online route planner . Traveling by combination of flight and taxi from Birmingham to Orange Beach takes 5 hours. Alternatively, you can drive; or do a combination of flight and car. In April, daytime highs in Orange Beach are 75°F, while nighttime lows are 58°F. Cap off your sightseeing on the 2nd (Thu) early enough to travel to Harvey. Harvey is a census-designated place (CDP) in Jefferson Parish, Louisiana, United States. You've now added Jean Lafitte Swamp Tours to your itinerary. To see reviews, more things to do, photos, and tourist information, use the Harvey planner . Traveling by car from Orange Beach to Harvey takes 3.5 hours. Traveling from Orange Beach in May, you will find days in Harvey are a bit cooler (70°F), and nights are somewhat warmer (70°F). 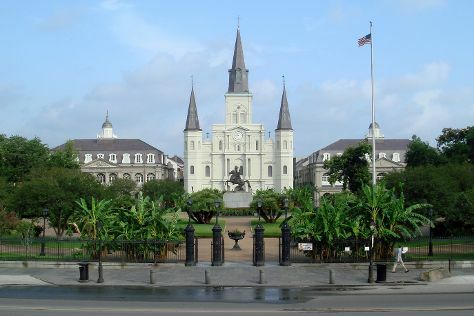 Wrap up your sightseeing on the 2nd (Thu) early enough to travel to New Orleans. To find other places to visit, ratings, traveler tips, and other tourist information, go to the New Orleans journey builder site . New Orleans is very close to Harvey. May in New Orleans sees daily highs of 70°F and lows of 70°F at night. Finish your sightseeing early on the 3rd (Fri) to allow enough time to drive to Jackson. Jackson, officially the City of Jackson, is the capital city and largest urban center of the U.S. Your day-by-day itinerary now includes Mississippi Museum of Natural Science. Start off your visit on the 3rd (Fri): have fun and explore at Mississippi Children's Museum and then get a new perspective on nature at Mississippi Museum of Natural Science. Discover how to plan a Jackson trip in just a few steps with Inspirock's itinerary builder. Traveling by car from New Orleans to Jackson takes 3.5 hours. Alternatively, you can take a train; or fly. While traveling from New Orleans, expect a bit warmer days and little chillier nights in Jackson, ranging from highs of 82°F to lows of 62°F. Wrap up your sightseeing on the 4th (Sat) early enough to travel back home.